This ornament is as simple as they come. It is fairly easy to put together and people love that it is made out of pasta. Spray paint your wagon wheels green and bells red. Glue the wheels into a pyramid, with one extra on the bottom to act as a trunk. Glue the bells over the center hole in each wheel except the trunk wheel. Add a cord to the top and hang on the tree. I love this little guy. 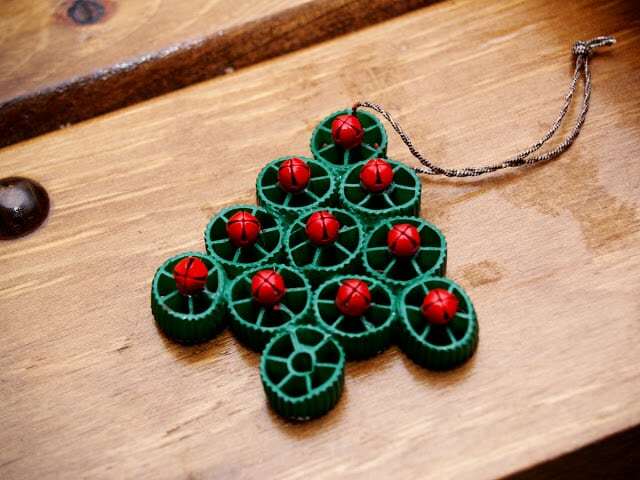 What kind of ornaments are you making for your tree this year? I am going to have to try this one with the kids. Very cute! THAT is pretty cool. I am impressed. You seriously are one of the most creative people I know! Thanks for the idea. This year we are making puzzle reindeer. I will save this idea for next year though!